This blog about the story of First Down Laser Systems and it’s inventor is the perfect community subject matter because involves a sports technology product, the business processes it takes to make it all so, and a vision and persistence that, Alan Amron, certainly has. First Down Laser has been around for a decade. Amron invented the Press on Memo back in 1973, otherwise known as the famous Post-it note. It was a real pleasure to speak with Alan and find out more about his sports tech creation that may be coming to an NFL field and your television shortly. Keeping the chain gang moving every ten yards is a football formula for success. When we watch games on TV, the yellow line lets the viewer know where the all-important first down, or line to gain, mark is. First Down Laser Systems, the in-stadium graphics designer that puts the first down line on the field in the stadium for all to see, is readying its demonstration models for trials with eager customers. The ‘green line’, used so successfully at the NCAA Outdoor Track and Field Championships in June, could revolutionize the way football is played, watched, and officiated. First Down Laser, with its end-zone projector and laser-embedded yardsticks, brings that technology to the field so players, coaches and fans inside the stadium can see what you see in your Sports Techie cave on crystal clear HD TVs, retina display tablets and smartphones. It is designed with the referee in mind. First Down Laser uses a wristband to interface with the system and a ring on the refs knuckle to place the ball correctly at the tip of the football. A instant laser line measurement where the ref turns the line on and off instantly, can save at least 3 minutes per measurement, which helps the NFL shave time off of lengthy games. The green line projects lasers 6-7 inches high, aimed down, off the field on top of weather elements like rain and snow, projected from the sideline flag sets. Why are all the lines on the football field — end lines, yard lines, end zone — so well marked while the first down line remains invisible? Why, in this age of technology (instant replay review of all scoring plays and turnovers in the NFL) are first downs still measured by chains? First Down Laser can either augment the current system or replace it, while bringing a state of the art exhibition of the line to the fans in the stands. Imagine players not having to visualize the first down line or look to the sideline during the play to try and figure out how far it is away. The flip side is that the defense also has no actual clue on-field where the imaginary line is. The resulting scrum at the first down line is some of the best action in all games, its man-a-mano, may the lowest guy who drives the hardest win that line. How would coaching change if teams used the ‘green line’ during practice and players could better know where the line is? First Down Laser can help in all of these aspects. Phase One laser in football is used only when the officials call for a first down measurement. (Rather than bringing out the chains, he simply turns on and off the laser line). Phase Three is the last step where the laser is left on all the time. Development, Inc.’s laser line system made its debut as an in-stadium visual enhancement of an athletic event at the 2013 NCAA Outdoor Division I Track and Field Championships at the University of Oregon’s historic Hayward Field. The laser system generates a 4-inch wide green stripe that is safe, visible, and a helpful marker for all watching or taking part in events. It was used Wednesday in the long jump and shot put events in the men’s decathlon and in the women’s long jump finals to indicate the longest distance of the day. It also appeared on Hayward Field’s video monitor. I. 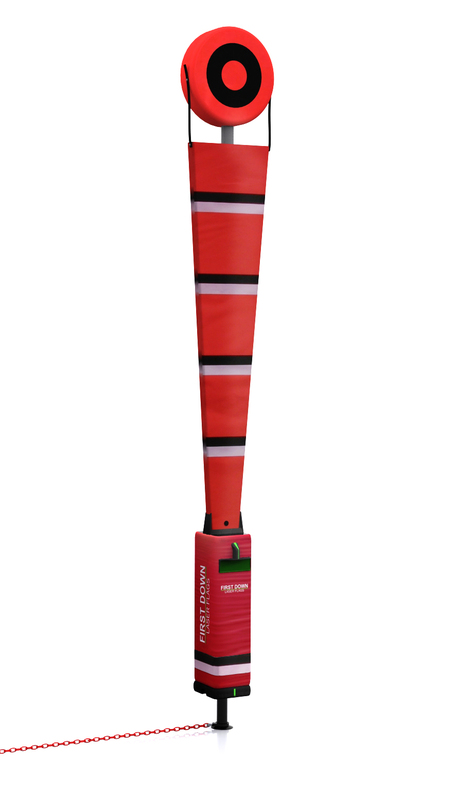 FIRST DOWN LASER – laser projector mounted on regulation flag chain sets for football. II. LEADING MARK LASER – in ground pop up laser projector systems for track and field events. Alan met the National Football League for the first time in 2003, then again in 2009 with the now deceased, Sports Techie broadcasting legend, Pat Summerall. 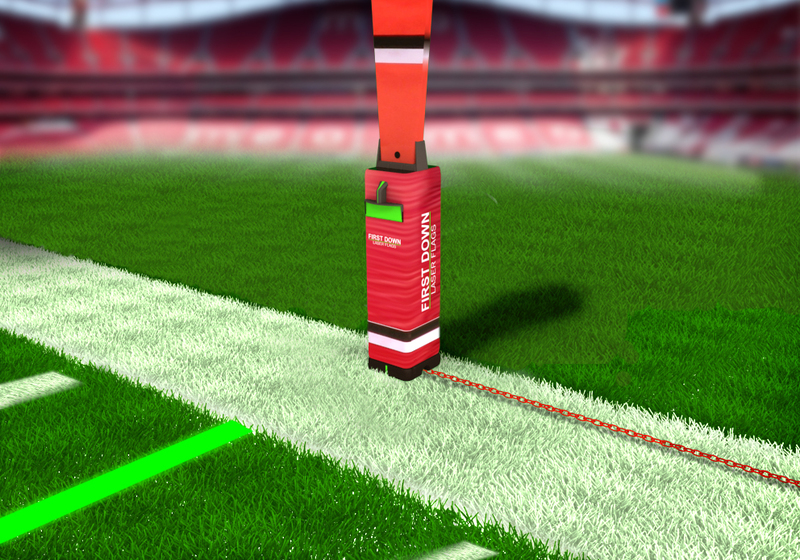 In 2013, Amron feels like it is finally, “NFL ready.” The marker is a 4″ wide green line that is projected from the bottom of the sideline first down markers across the field, controlled by the officials. 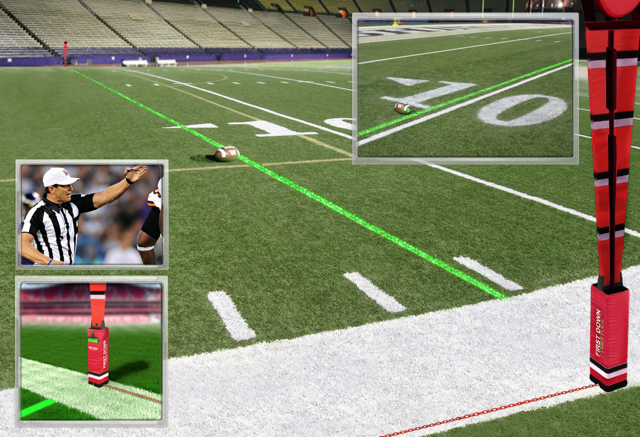 It also gives players a reference on the field and helps with spotting the ball. What the NFL wants is this to be less expensive and safer, there was some worry from the competition committee about showing up the official but since last season’s eye-opening replacement ref experience, all bets are off that offending the ref’s matters at all when getting the call right is in everyone’s best interest. The NFL introduced Thought Development to their official flag sets manufacturer who also supplies the NCAA and will announces working with them should the time come. The yellow line began on one camera only, and then the league upgraded to two cams, today, several cameras will have it integrated but not all of them do. The Super Bowl uses 28 cameras which makes it cost prohibited to install the yellow line on each cam. If they use the green line, all cameras will have the ability to broadcast it from any and all cams. Instant replay took about 7 years to overcome the last objections before full acceptance. After this season is over, the NFL replay system will undergo a due diligence review to see if any changes or tweaks are needed. The overhead cam was originally used in the XFL and took approximately 6 years to become a NFL broadcasting norm at home and on the stadia big screens. Fan experience is a major priority for the NFL which means ten years later, Alan’s company is on the right track to finally see the light. Sports Techie, Alan and I are connected on LinkedIn, in fact, it his is preferred social media platform. He is full Sports Techie, entrepreneur and inventor, as well as a concept promoter. He has 39 patents and counting. Alan has invested $1.5 million of his own cash in the green laser line. Amron says if a laser is used on the field to measure here in the United States, they have infringed on his patent. Thought Development is looking for a financial round on their way to going public in the $3 million range. First steps are to find users who will champion the sports tech. The CFL, Arena Football and the NCAA, plus high school, are other targeted users. The failsafe steps in terms of power is that it runs on fiber-optics with the energy source safely protected inside a stadium tunnel. Just in case, on site generators will be in place to power up in case of an unforeseen emergency. Sponsors like Pepsi or Coors Light can partner with the green line, as in, brought to you by Microsoft. Alan feels that all sports, fans and sponsors will take to the green line the same way folks like the laser light shows at Disney. The three things the NFL should have in place already are first down lines on the field, lines that extend up from the goal post and a sensor in the ball to figure out the correct placement. Alan’s system can either augment the current Chain Gang model or replace it. He mentioned that he invented an ink that can be used to figure out where the ball should be marked because technology likes RFID chips are considered too heavy and adversely affect the flight of the ball in tests, according to NFL feedback. I told Alan they should use it at the NFL combine for the 40-yard dash line which is something he had not considered. Training camp and practice can also use the system. Fantasy sports owners who need just ten more yards to win the game will be delighted to have this tool. We all know the human eye is lucky to get within an inch of being right when placing the ball down, so 1/16th of an inch, every time, sounds like a no-brainer provided it is safe. I do not buy any cost issue objections from the billion dollar NFL. Follow the game action, know where they are running to on TV or inside the stadium, whether you are playing or watching the game, with First Down Laser Systems. See http://www.firstdownlaser.com/. Now, even laser technology is getting in the game, finding a new application not in manufacturing equipment but in setting up right down on the field, where it can change the sports experience for participants and fans alike. The green line from Sports Laser Technologies, a division of Thought Development Inc. of Hempstead, N.Y., is a laser-projected marking visible in-stadium to fans, players and officials. In its football application, the device is called First Down Laser, and it indicates the line to gain (the first-down line) in football. In track and field, it s called the Laser Leading Line, and it shows distance markings in events such as the long jump, triple jump, hammer throw, discus, javelin and shot put. It can be used in other sports, too: for offside marking in soccer, tracking the positions of vehicles in auto racing, and more. The technology made its debut in sports use in June 2013 at the NCAA Outdoor Division 1 Track and Field Championships at Hayward Field in Eugene, Ore. The meet was televised by ESPN, giving fans worldwide a look at the new laser markings. The laser use was popular with both fans and athletes, according to Mark James, a USA Track and Field Foundation board member, and the device was used again at the 2014 meet.